Steinberg Skating Rink has been a popular winter spot for years. Ice skating and hot cocoa go together like Christmas and carols. 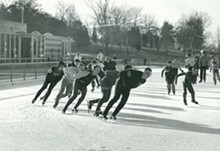 Every year, Steinberg Skating Rink in Forest Park (www.steinbergskatingrink.com) is open from early November to late February, providing the Midwest's largest outdoor rink for the low price of $7 a day. Your $7 is good for the whole day, from 10 a.m. to 9 p.m. Sunday through Thursday and 10 a.m. to 11 p.m. Friday and Saturday. Skate rental is another $7, which is a steal — but just because it's so affordable doesn't mean you have to bring the family. If you're tired of the in-laws, their kids or just want to get out of the house, Steinberg is there for you. Nothing clears the head like a brisk skating session and hot cocoa by an outdoor fire.